Over an Ocean, Across a Continent, Up a River: PfaP Delivers! Our first joyful moment in Zambia was watching all 11 bags of supplies arrive in Customs in Lusaka. With many thanks to Dave Seaman at Tours Africa , everything went smoothly. Kafunta River Lodge,which supports Project Luangwa, was our first stop. We were warmly welcomed and soon enveloped in Zambian hospitality. During our dinner under the stars in Kafunta, when Pack for a Purpose was brought up in the discussion, John, a guest from Australia said, I packed for a purpose when I came to Kafunta last year. As you can imagine, it was thrilling to meet a pack for a purpose traveler who brought supplies a year before. John, who is a retired TV personality, was the host of a travel show in Australia. He was gracious enough to give us a video interview on his Pack for a Purpose experience. His comments can be heard on the video at the end of this Blog. The majority of the supplies which we brought for Project Luangwa were fleeces and shirts for school children and readers for those who needed them in the community. The gently used clothing was provided by Carroll Griffin of Atlanta. 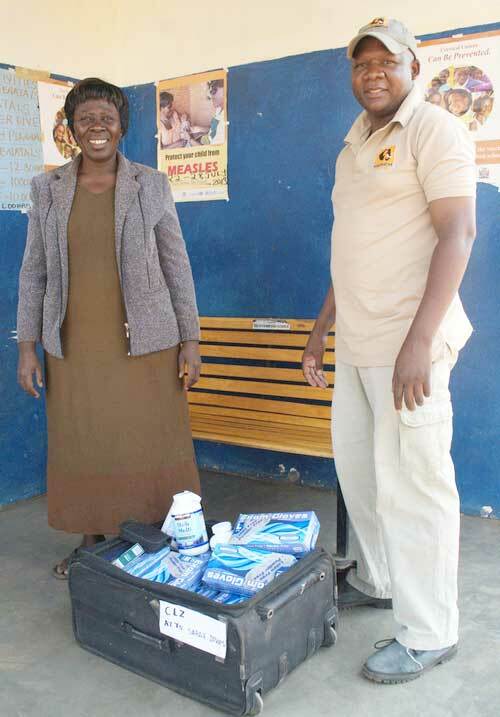 They were donated by the school her children attend. 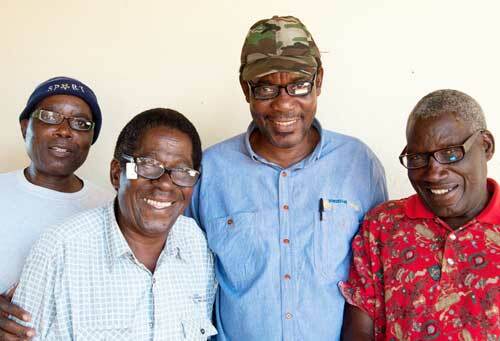 The readers were generously provided by ICU Eyewear and gave over 180 members of the local community an entirely new view of the world. 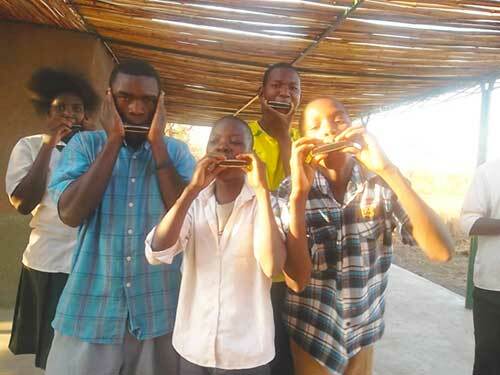 Karen Beattie, the director of Project Luangwa, kindly sent us the photos from Zambia of the beneficiaries of these supplies. 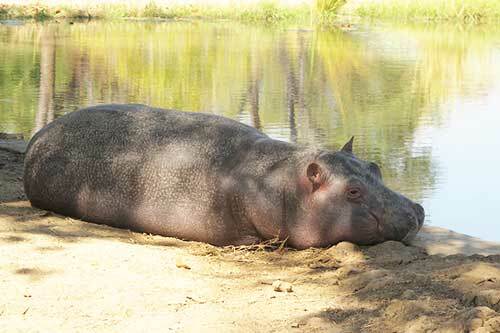 Chipembele Wildlife Education Center, is located near Mfuwe not far from Kafunta River Lodge. It is one of the projects supported by Lion Camp, the second lodging on our trip. We had the great pleasure of spending an afternoon at the Center with Anna and her husband Steve. The educational opportunities they have created for the local children are extraordinary and are making a big impact in the community. Art and school supplies were among the items we brought for use at the Center. While we were there, we had the additional pleasure of seeing the orphaned baby hippo they are rehabilitating with the hope of reintroducing it back into the wild. Watching the hippo gulp, slurp and inhale an entire gallon of milk in a matter of seconds was awesome. Anna’s comments about the Center’s work and how you can help them are part of the video at the end of the blog. 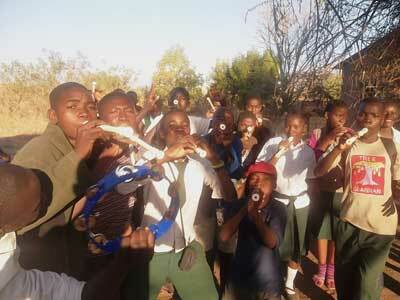 We spent the afternoon jammin’ with the Chipembele Wildlife Conservation Club before we left for Lion Camp. This fantastic after-school program educates students about the critical importance of protecting local wildlife and the environment. Music is often the platform they use to convey the message. Noah, the child of our heart, who accompanied us on our trip, was very eager to volunteer at one of the projects. When Anna and I discussed the possibilities and she learned Noah is an accomplished musician, she recommended we volunteer in the after-school program. I contacted Ben Heermans, the director of the program and asked what they could use. They were woefully short of actual musical instruments, he told me, and requested harmonicas, recorders and tambourines. With a generous donation from the Hubbell family, Nina Patel of Vacations that Matter and Falls River Music, we were able to bring 42 instruments, sheet music, guitar strings and tuners. Three hours passed quickly with strumming, drumming, singing and dancing. Noah brought his ukulele, an instrument none of the students had previously seen or heard. The ukulele provided great delight and another musical experience that was thoroughly enjoyed by all. After the jam session, Noah was invited to lay down a track of his ukulele music at the local recording studio, Bush Records, with two local artists, Bush Doctor and 50 Sugah. Bush Doctor volunteers a lot of his time to work with the Conservation Club and last year, they put out a CD of their songs to help raise money. To immerse yourself in a small part of the jam session and see the magical interaction, click here. When we arrived at the airstrip in Lower Zambezi National Park, our first stop was at CLZ (Conservation Lower Zambezi), the project sponsored by Chiawa and Ol Mondoro. We spent a very informative time there while Ian, the Chief Executive Officer, explained the project and its impact on the community. Both Chiawa and Old Mondoro, where we stayed the last 6 night of our trip, support this project. Grant Cummings, the owner of both camps, was one of the co-founders of CLZ, which was established in 1996. 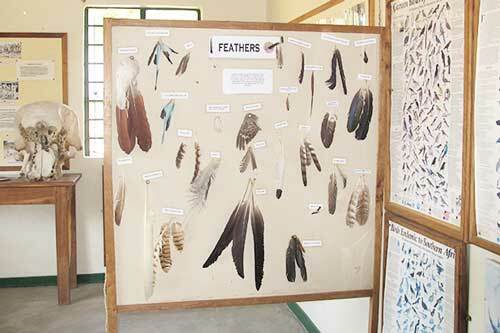 There are many programs under their auspices including conservation education programs. 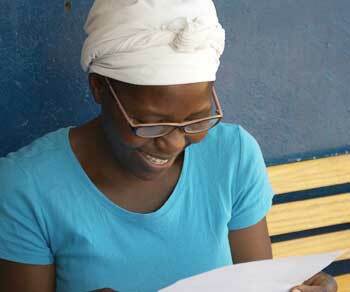 We brought art and school supplies for that program, reading glasses to distribute to those in need in the community and first-aid supplies that were shared with the local clinic. 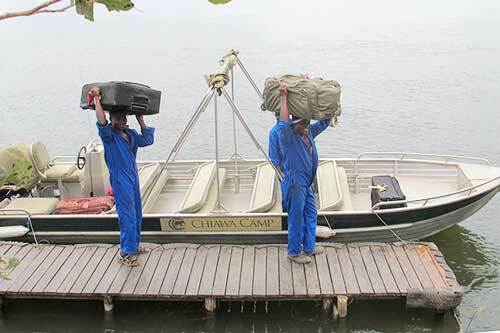 We had the delight of watching the supplies, which had arrived via truck from Lusaka, be loaded onto a boat to be taken upstream to CLZ to their final destination. These supplies, which came from California, Georgia and Raleigh, had traveled by jet, truck and motorboat to reach CLZ. 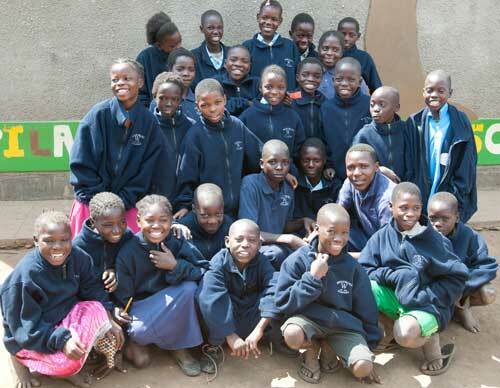 Our partner, Sharon Luggage , provided us with luggage that could be left and used in Zambia. What a journey. Sarah Davies, the Base Camp Manager for CLZ kindly shared the photos from the glasses distribution and the clinic receiving some of the donated first-aid supplies. Packing for a Purpose in Zambia enabled us to give back to the communities where we stayed in a meaningful way, enriching our entire experience. Bringing a hostess gift makes the trips we take go much farther than the miles we travel. Click here to watch and listen to the video of Grant, Anna and John discussing how Pack for a Purpose benefits their communities and the rewards that packing for a purpose gives to travelers.